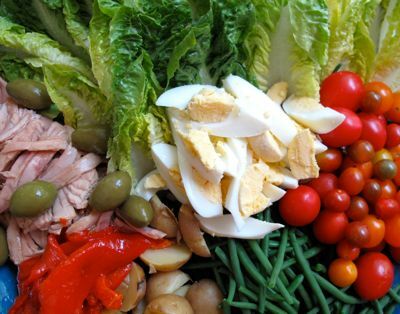 At any rate, served in this manner, the salad is a bit of a “buffet” of sorts, and guests can take whatever ingredients they prefer to construct their personal salad. The anchovies were served on the side as they are rather strongly flavored and not everyone likes them. This is a complete meal in one dish, and perfect for the hot summer days ahead. Have you tried Rio Mare canned tuna? They’re little pink cans with what looks like crushed tuna soaked in oil (olive oil?) and have a bit of “creamy” texture to them. Great with salads or quick pasta meals. Though im not sure if we have it here I always get mine when my mom comes home from Italy. i agree with the tuna sourcing. my mother-in-law was so haughty about using “imported” canned tuna but when we saw the label, it was sourced from the philippines. it really does help a lot when you read the label. Some of the thai brand tuna I buy here comes from the Philippines. BTW, I wonder which type tuna Century cans. Albacore, though highly migratory seems to be the one more abundant in Philippine waters but does not seem to be as endangered as the other more prized species. I recently visited several fish markets on a drive on a whim along the eastern towns of Oriental Mindoro from the northern tip to the south, a 2-3 hour early morning drive. Every kitchen must be cooking tuna that day as all they had at the fish markets were tuna. Must be the full moon. MM, would you please care to deconstruct the dressing for this salad Nicoise. I am sure, that if I google it, I will find the ingredients for the dressing but I wonder how your dressing will be different. Thanks. I made the salad before but substituted roast beast instead of tuna. 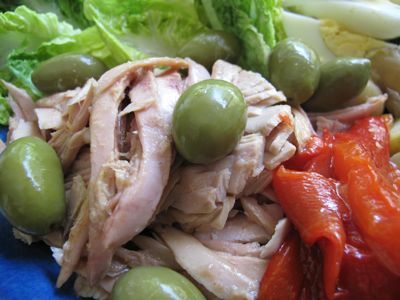 Would the salad taste the same with the substitution of sardines instead of tuna? Fresh sardines (grilled with a squeeze of lemon) would be best but a good bottled sardine might be a more sustainable choice given tuna scarcity. MM and others: ….NOt to burst oyur bubble but please take note of your tuna intake. I learned from nerve-wracking experience! As I have said before, my son was a few mg. away from outright mercury poisoning! I am talking about only 8 years of eating tuna in any form…salads, sandwiches, SUSHI, etc. I have since resorted to serving smoked BLack Cod or smoked Salmon (which I smoke myself when Black Cod and wild salmon is on sale!). MM, You mentioned Century Tuna a long time ago. Ako naman, I rushed out to buy a can at the Pinoy store!…Maybe I bought the wrong kind but I wasn’t impressed by the can of tuna adobo I bought. …not enough tuna in the can. I should have just bought the regular tuna here in chnks and sauteed it or better yet, bought King Mackerel steaks and made it into adobo. At any rate, I am going there (Pinoy store) again and this time try the premiun canned tuna. Jose…Ages ago, I bought my tuna at BOSA (Italian grocery store) in Olive OIL…never bothered to look whre it is produced or distributed. Recent studies in Canada and the U.S. are raising the alarm on canned white or albacore tuna exceeding minimum mercury guidelines of 0.5 parts per million. The food authorities are not saying to not eat tuna altogether but are just saying to eat in moderation as mercury tends to accumulate in the body. The “Light ” tuna appears to have lower levels. The white or albacore are older fish that have accummulated the mercury longer. Salmon and sardines have stayed below the guidelines and are deemed better substitutes. MM…do you roast your shallots first before making the dressing? …try it! caramelized whole shallots makes a huge difference! the â€œsqueakâ€ of haricots verts… a very accurate sound/taste/bite description. Not really a crunch and not a squish. This is a description that has escaped me for centuries (century tuna?) Salamat MArketman! Haha! I guess I should always read the label. Btw those tomatoes look gorgeous! Have you tried making tabouleh with those? Jose, I didn’t make tabouleh with those tomatoes, but I have featured a post with tabouleh and other mezzes, here. The ahi/tuna served for sushi/sashimi here in the US come from Philippines. I used to work in a sushi restaurant and the ahi blocks had a “Caught in the Philippines” tag. Hershey, yes, they did to use to sell them at Terry’s. But I haven’t seen them in the Pasong Tamo store lately. Hmmm, if they have them at podium I would make the trip to stock up when I run out… bettyq, regular century tuna is a FAR CRY from the premium cans, no comparison at all. I know now, MM…went back to Pinoy store and asked for Century premium tuna…they don’t sell it since the grocery stores carry the tuna packed in oil or broth or water. The salad was delicious and the tuna exceptional. You might want to add some sliced red onion and some capers. At first I thought the picture was of a “PinoyÃ§oise” salad because the haricots verts looked like sitaw. Perhaps the recipe might work well with good sardines in olive oil, blanched sitaw and itlog maalat subbed for their counterparts in the French classic. Hi, MM. I was able to buy some Century Premium Tuna (chunks in water) in S&R Congressional Avenue yesterday. 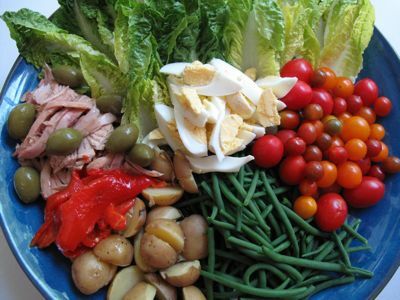 I love nicoise. . . its a complete meal itself. . . I remember we do a chi chi version before, and instead of flaked tuna we put a good portion of seared tuna steak on top of the salad drizzled with olive tapenade. . . it’s just YUMMMM and one of the bestsellers. . . 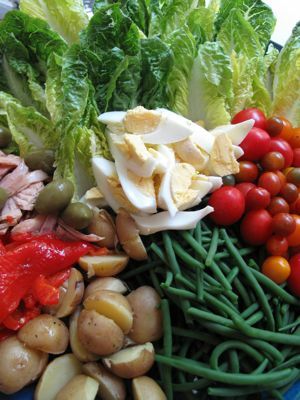 I totally love salade Nicoise too. Then a while back, I came across an old US Good Housekeeping magazine that had a brilliant serving suggestion for a big crowd. It pictured a whole platters of Nicoise, but instead of canned tuna, it had a whole slabs of pan-fried salmon, for a more substantial one-dish meal. I do that often now and it’s always a big hit. Remember to serve with additional dressing on the side. I spotted Century Tuna Choice at Terry’s Salcedo. They were selling at P295 per can. Marketman & Family Strongly Support the RH Bill!